Body mass index (BMI) is a measure of adiposity . A raised BMI is a risk factor for several diseases such as type 2 diabetes mellitus [2, 3]. Generally, prevalence and complications of diabetes is more pronounced in females than males as result of gender associated obesity. Our multi-disciplinary research group is involved in assessment and study of diseases and associated issues of public health concern in South western Nigeria. In this study, the occurrence of diabetes in a sub urban Nigerian Community and its relationship with BMI and random blood glucose (RBG) was assessed. One hundred forty apparently healthy individuals aged between 20 and 70 years were recruited. Thirty-four percent males and 66 % females participated in the community health programme. An erratum to this article can be found at http://dx.doi.org/10.1007/s13410-014-0197-8. Whitlock G, Lewington S, Sherliker P, Clarke R, Emberson J, Halsey J, et al. Body-mass index and cause-specific mortality in 900 000 adults: collaborative analyses of 57 prospective studies. Lancet. 2009;373:1083–96. Diaz VA, Mainous AG, Baker R, Carnemolla M, Majeed A. How does ethnicity affect the association between obesity and diabetes? Diabet Med. 2007;24:1199–204. 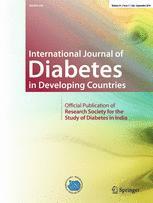 Shrivastava M, Singhal R, Shrivastava G, Gupta A. Obesity and gender differences in risk of type 2 diabetes mellitus in Rewa district. J Pharm Res. 2011;4:2643–4. Pelletier DL, Rahn M. Trends in body mass index in developing countries. Food Nutr Bull. 1998;19:223–39.